A buddy for babies! 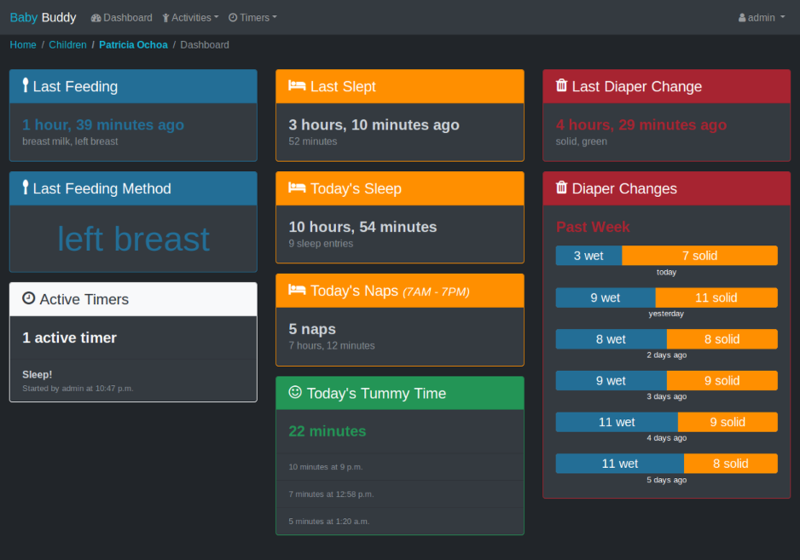 Helps caregivers track sleep, feedings, diaper changes, and tummy time to learn about and predict baby's needs without (as much) guess work. The default user name and password for Baby Buddy is admin/admin. For any deployment, log in and change the default admin password immediately. Many of Baby Buddy's configuration settings can be controlled using environment variables - see Configuration for detailed information. A basic Elastic Beanstalk configuration is provided in .ebextensions/babybuddy.config. The steps below are a rough guide to deployment. See Working with Python for detailed information. Create an IAM user in AWS with EB, EC2, RDS and S3 privileges. The create command will also do an initial deployment. Run eb deploy to redeploy the app (e.g. if there are errors or settings are changed). A Docker deployment requires Docker and Docker Compose to create two containers - one for the database and one for the application. See Configuration for other settings that can be controlled by environment variables added to the docker.env file. The app should now be locally available at http://127.0.0.1:8000. See Get Started, Part 6: Deploy your app for detailed information about deployment methods with Docker. See Configuration for other settings that can be controlled by heroku config:set. There are many ways to deploy Baby Buddy manually to any server/VPS. The basic requirements are Python, a web server, an application server, and a database. This example assumes a 512MB VPS instance with Ubuntu 16.04. It uses Python 3.5+, nginx, uwsgi and sqlite and should be sufficient for a few users (e.g. two parents and 1+ child). Note: Python dependencies are locked on x86-64 architecture. Installs on other architectures (like Raspberry Pi's ARM) may result in a THESE PACKAGES DO NOT MATCH THE HASHES FROM Pipfile.lock! error. Add the --skip-lock flag to the above command to suppress this error (i.e. : pipenv install --three --dev --skip-lock). See the uWSGI documentation for more advanced configuration details. Note: Find the location of the pipenv virtual environment for the virtualenv parameter with the command pipenv --venv. See the nginx documentation for more advanced configuration details. Environment variables can be used to define a number of configuration settings. Baby Buddy will check the application directory structure for an .env file or take these variables from the system environment. System environment variables take precedence over the contents of an .env file. This option may be set to a single host or comma-separated list of hosts (without spaces). This should always be set to a specific host or hosts in production deployments. Whether or not to allow uploads (e.g. of Child photos). For some deployments (AWS, Heroku, Nanobox) this setting will default to False due to the lack of available persistent storage. Required to access your AWS S3 bucket, should be uniquely generated per bucket for security. If you would like to use AWS S3 for storage on ephemeral storage platforms like Heroku you will need to create a bucket and add it's name. See django-storages' [Amazon S3 documentation] (http://django-storages.readthedocs.io/en/latest/backends/amazon-S3.html). When in debug mode, Baby Buddy will print much more detailed error information for exceptions. This setting should be False in production deployments. See also Django's documentation on the DEBUG setting. The maximum start time (in the instance's time zone) before which a sleep entry is consider a nap. Expects the format %H:%M. The minimum start time (in the instance's time zone) after which a sleep entry is considered a nap. Expects the format %H:%M. A random, unique string must be set as the "secret key" before Baby Buddy can be deployed and run. See also Django's documentation on the SECRET_KEY setting. The time zone to use for the instance. See List of tz database time zones for all possible values. Baby Buddy uses the Django REST Framework (DRF) to provide a REST API. The only requirement for (most) requests is that the Authorization header is set as described in the Authentication section. The one exception is the /api endpoint, which lists all available endpoints. By default, the TokenAuthentication and SessionAuthentication classes are enabled. Session authentication covers local API requests made by the application itself. Token authentication allows external requests to be made. Each user is automatically assigned an API key that can be used for token authentication. This key can be found on the User Settings page for the logged in the user. To use a key for an API request, set the request Authorization header to Token <user-key>. E.g. If the Authorization header is not set or the key is not valid, the API will return 403 Forbidden with additional details in the response body. Field-based filters for specific endpoints can be found the in the filters field of the OPTIONS response for specific endpoints. count: Total number of records (in the database, not just the response). next: URL for the next set of results. previous: URL for the previous set of results. results: An array of the results of the request. All endpoints will respond to an OPTIONS request with detailed information about the endpoint's purpose, parameters, filters, etc. To add new entries for a particular endpoint, send a POST request with the entry data in JSON format in the request body. The Content-Type header for POST request must be set to application/json. Regular sanity checks will be performed on relevant data. See the OPTIONS response for a particular endpoint for details on required fields and data formats. Returns JSON data in the response body describing the added/updated instance or error details if errors exist. Errors are keyed by either the field in error or the general string "non_field_errors" (usually when validation incorporates multiple fields). Contributions are welcome! See CONTRIBUTING.md for detailed information about how to develop and contribute to Baby Buddy.